That means that i can't connect to my database. I havent made any changes on the database or change any of my files. Probably not, based on the almost complete lack of details. Is it "All your code?" That is, did you write it all and host it yourself? I have to ask that since every example I read such as http://plnkr.co/edit/OyGY7VVNSSAjdstr54wG?p=preview finds scripts loading from the web. So how do you check if those sources didn't change? No, i dont use any files from the web. I use local files. Is it because of dublicate entries? Could it be a .access thing? Header add Access-Control-Allow-Headers "origin, x-requested-with, content-type"
Header add Access-Control-Allow-Methods "PUT, GET, POST, DELETE, OPTIONS"
One of the Windows OS complaints is that updates can reset settings and break installed apps. You've found that you can't connect to your server so that's what you work next. I don't admin your setup so you are the expert at this point with you going over your setup and settings. But other projects i use on localhost work just fine. Only my Ionic project with authservice doesnt work. WHt should i check first? 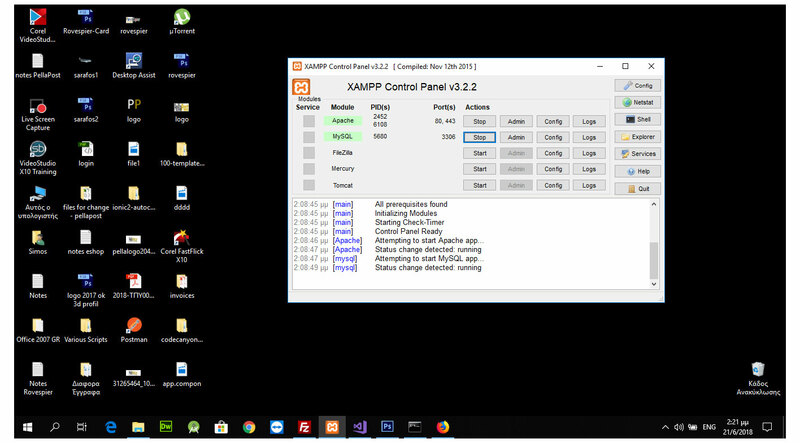 That XAMPP, I don't recall that it built in Auth service like https://auth0.com/ I'd ask instead how to test your auth service. Anyone knows what that means? Where should i start to look to solve this data is null issue? Ionic 3 and Angular 4: Compatible framework for Ios and Andorid?